Successfully Added Excelsior - 7 Inch DVB-T Mobile TV with Digital TV Recording to your Shopping Cart. Get quality widescreen entertainment anywhere you go with the Excelsior 7 Inch LCD DVB-T Mobile TV, perfect as a gift and also for your media needs outside or on the move. 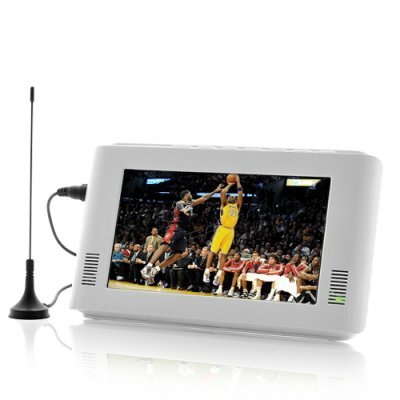 Ever found yourself sitting on a long train or bus journey with nothing to do and feeling that your time was wasted, well look no further than the Excelsior Mobile TV, you can enjoy crystal clear Digital TV, Movies, Radio, Games, Pictures, Books and Music all from one compact and convenient piece of technology. Whether you’re travelling on a long or short trip, or you just want to hang out outside and watch TV in the lovely weather, you’ll find the Excelsior packed full of entertainment value. The Excelsior Mobile TV is fully DVB-T compliant and comes with a powerful but lightweight battery to provide you with hours of portable entertainment at an amazing price. The Excelsior features an excellent widescreen 7-Inch display with a 720x576 PAL resolution, for superb viewing pleasure. Insert your SD, MS or MMC card filled with all your favorite movies, music, e-books and pictures and just slide it into the Excelsior to further combine all your entertainment needs. You can even download and play some fun games which are available and free from the Native32 game website. The Excelsior SD slot supports up to 8GB, which is equivalent to 20 hours of movies, enough to constantly entertain you on those long difficult journeys. Be the envy of all the other travelers around you, who will be kicking their feet for not having managed to buy the Excelsior Mobile TV for their journey. You can be the center of attention, everyone will want to join in with you and enjoy watching the Excelsior. Or you can even use it to break the ice and offer to invite the interesting lonely girl or boy you notice across from where you are sitting to watch TV or a movie with you. The Excelsior isn’t just any product; it’s something that can positively improve your life through the entertainment and opportunities it provides. Order yours today and we'll ship it out tomorrow. Available from your source for high tech electronics, Chinavasion. on 2012-03-16 04:59:17 Very fast delivery, product 100 % ! Very fast delivery to Belgium (4 days !). The product (excelsior DVB-T 7") is what I was looking for ; while driving, image is still very good. Fast and correct service. Thank you. The video quality on this unit is pretty good. Sound quality is also good. Picks up all Digital stations without any problems. Very satisfied with the product.